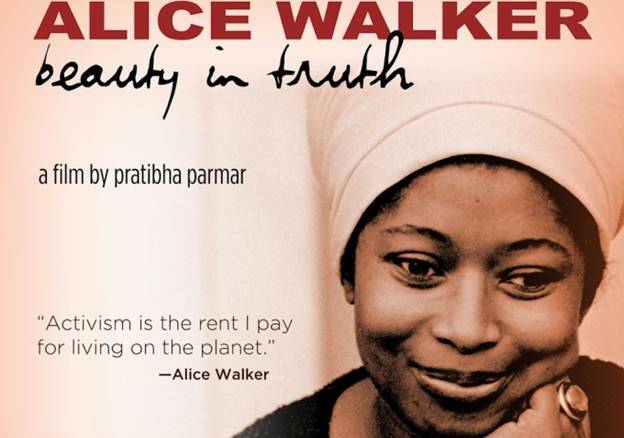 Alice Walker: Beauty in Truth Premieres Nationally | Tonight at 9 p.m. Writer and activist Alice Walker (b. Feb. 9, 1944) made history as the first African-American woman to win the Pulitzer Prize for Fiction for her seminal novel The Color Purple (1982), for which she won the National Book Award. American Masters presents Alice Walker: Beauty in Truth, premiering nationally Friday, February 7 at 9 p.m. on PBS in honor of Walker’s 70th birthday and Black History Month. Filmmaker Pratibha Parmar’s new documentary tells Walker’s dramatic life story with poetry and lyricism, and features new interviews with Walker, Steven Spielberg, Danny Glover, Quincy Jones, Gloria Steinem, Sapphire and the late Howard Zinn in one of his final interviews. American Masters — Alice Walker: Beauty in Truth charts Walker’s inspiring journey from her birth into a family of sharecroppers in Eatonton, Georgia, to the present. The film explores Walker’s relationship with her mother, poverty, and participation in the Civil Rights Movement, which were the formative influences on her consciousness and became the inherent themes in her writing. Living through the violent racism and seismic social changes of mid-20th century America, Walker overcame adversity to achieve international recognition as one of the most influential — and controversial — writers of the 20th century. Delving into her personal life, Alice Walker: Beauty in Truth reveals the inspiration for many of her works, including Once (1968), The Third Life of Grange Copeland (1970), Meridian (1976), The Color Purple (1982), In Search of Our Mothers’ Gardens (1983), Possessing the Secret Joy (1992) and Overcoming Speechlessness (2010). Praised and pilloried, Walker has driven people to express joy as well as anger and ruthless vilification over her art, personal views and global human rights advocacy. As seen in the film, Yoko Ono awarded her the 2010 LennonOno Peace Award for her ongoing humanitarian work. American Masters analyzes these aspects of the self-confessed renegade’s life and career. American Masters — Alice Walker: Beauty in Truth is one of 50 films that form part of Women and Girls Lead, a public media campaign spearheaded by the Independent Television Service, that harnesses the power of documentary film to showcase extraordinary women and girls who are changing the world. The initiative features groundbreaking women like Alice Walker, who refuse to submit to gender stereotypes or compromise her form of artistic expression. Director Pratibha Parmar’s past works include feature film Nina’s Heavenly Delights (2006) and the documentary Warrior Marks (1993), based on the book of the same name that she and Walker co-authored. Alice Walker: Beauty in Truth is a Kali Films LTD and Kali8 Productions LLC and American Masters for THIRTEEN production in co-production with Buddhist Broadcasting Foundation and the Independent Television Service and in association with Artemis Rising Foundation. Pratibha Parmar is writer, director and producer. Shaheen Haq is producer. Babeth M. VanLoo, Eve Ensler, Regina Kulik Scully and Deborah Santana are executive producers. Pratibha Parmar, Paul Monaghan and Linda Peckham are editors. Original music composed by Tena R. Clark and Tim Heintz with featured music by Christen Lien. Andy Shallal is associate producer. For American Masters: Susan Lacy is executive producer. Stephen Segaller is executive-in-charge. For Independent Television Service: Sally Jo Fifer is executive producer.